Beatrice Bee was flying around Storyland on a very hot summer day. It was so hot that she had sweat in her eye. “Oh dear,” said Beatrice, rubbing her eye with her wing. While she was flying, she almost flew into a tree. She decided that she better land and get rid of the sweat in her eye before she seriously hurt herself. “Watch out!” Beatrice heard someone scream. “Oh sorry,” said Beatrice, landing on someone’s nose. “You should be more careful,” said a man, wearing a safety vest. It is a good idea to be aware of your surroundings. Example: Beatrice Bee had sweat in her eye and almost hurt herself. 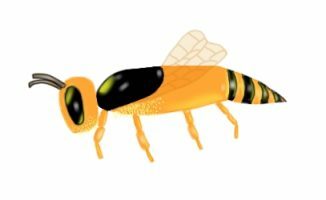 This entry was posted in Beatrice Bee Stories, Grade 3 Level, Safety Kid Stories, Summer Stories, Summer Story Challenge 2017 and tagged Beatrice Bee, safety, Safety Kid, Summer Safety. Bookmark the permalink.